If there is a class of civil servants in Akwa Ibom State that have been perennially marginalized, deeply stigmatized and greatly insulted, it is teachers in the about 1110 public primary schools in the state. Their story is a tragic reminder of the agonizing era of slavery when slave-workers who devoted the totality of their lives to the service of slave masters and the society were never properly appreciated and compensated. Unlike their counterparts in public secondary schools, primary school teachers in Akwa Ibom State are relegated by the state government to a point that silence is no longer golden. It is as if they have sinned against God and humanity. The current travails of these oppressed teachers cannot be exhaustively addressed in this piece, it will require writing a textbook if one were to attempt an exhaustive narrative of their travails. But for the purpose of this essay, few examples will suffice. How does one explain the fact that till now, the third week of August 2014, teachers in public primary schools in Akwa Ibom State are yet to be paid their meagre salaries for the months on June and July 2014. How can a government that prides itself as being pro-people owe those who have the historic task of laying a foundation for our children’s education for two months? These are people with families to cater for, people who do not have any other serious source of income. The state government has equally been very unconcerned about other welfare components of these teachers such as; belated reflection of promotion in salary, leave grant, pension and gratuity, etcetera. For instance, primary school teachers who were recruited in 2001 whose promotion was due in 2010 only received their promotion arrears in 2013. Promotion in the state’s civil service is every three years. Thus, those teachers who were recruited in 2001 were due for another promotion in 2013, but till date, this has not reflected in their salaries. Before now, promotion for these teachers was based on year of ‘certification’ and employment but the Godswill Akpabio regime in its sense of justice has now changed it to solely year of employment. Meaning that prior to now, a teacher who acquired his qualifying certificate (usually the National Certificate of Education, NCE) say in 2007 will be step(s) ahead of a teacher who acquired his in 2006 in the salary scale, notwithstanding that both were employed the same year. But now, both are being promoted solely based on year of employment. Presently, the leave grant of these teachers for year 2013 and 2014 has not been paid. That of 2012 was only paid by the government after much bickering and pressure from the teachers. Primary school teachers who had retired from the state’s civil service in 1991 till date have not been paid their gratuity. Many of them have died while waiting to receive the fruits of their life time labour. The state government in an attempt to avoid accepting responsibility and blame has serially made untenable and non cogent excuses. The government has advance an irresponsible alibi by shifting the blame to local government councils in the state. The excuse of the state government is that salaries for primary school teachers is funded jointly by the state and local governments and that the state government have always made their counterpart funds available on time. This excuse on the face of it look sensible, but a critical appraisal of the situation shows that the state government is being economical with the truth. It should be stated that the State Joint Local Government Account created by Section 162 (6) of the 1999 Constitution of the Federal Republic of Nigeria (as amended) from which the salaries of these teachers are drawn is constitutionally under the exclusive control of the state government. 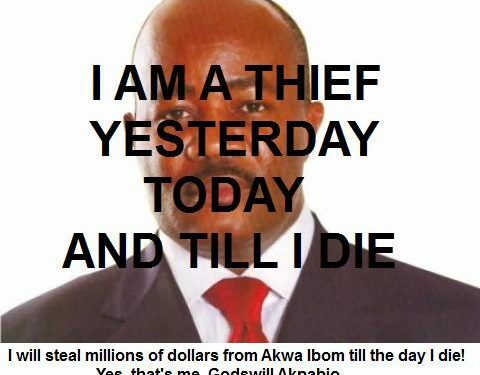 The question is: has governor Godswill Obot Akpabio been remitting funds standing to the credit of local government councils in the state to them as and when or has he been deducting same? Let Akpabio answer this question with relevant documents, facts figures and the whole world will know who is telling the truth and who should be held liable for the suffering of these teachers. This is a challenge. Also, the state government has been hiding under the notorious veil of endless “verification exercise” as the reason for delay in payment of salary to primary school teachers. This is itself ludicrous. What is the government always verifying year in, year out? Presently, the state government is hiding under yet another nebulous verification exercise (this time biometric) as the reason for not paying these poor teachers their salaries for the months of June and July. How come that their secondary schools counterparts are not being subjected to the same tormenting treatment? The State Universal Basic Education Board (SUBEB) which is legally responsible for the recruitment and welfare of primary school teachers has become a very clandestine and unaccountable entity for “empowering” political allies. The board has been severally accused of corruption by teachers and public commentators. A teacher in one of the primary schools in Uyo, the state capital, bluntly told this writer that SUBEB is a trading center where only the highest bidder gets attention. Sadly, the state branch of the Nigerian Union of Teachers (NUT) is almost worse than useless. NUT in Akwa Ibom is anything but a union. Successive leadership of the body seems to be trading away the rights and privileges of primary school teachers for 40 pieces of silver. While delivering a paper titled: “Transforming Nigeria’s Economy: Opportunities and Challenges” on Saturday 31st May, 2014 at the Babcock University, Ilishan-Remo, Ogun State, the Finance Minister, Dr. Ngozi Okonjo-Iweala, had listed Akwa Ibom State as the first among the 10 highest revenue receiving states in the country. She put the total amount of allocation to the state from the Federation Account for year 2013 at 260 billion naira. Further analysis of this amount according to the Minister shows that the state allocation during the year exceeded the budgets of most neighbouring countries like Liberia, Gambia, among others. The state is still leading other states in revenue. The question is; where is our money? Admittedly, the Godswill Akpabio-led government has made appreciable impact in infrastructural development, but then, it will be wrong to rate and assess the performance of a government without a dispassionate reference to indices like revenue, land mass and population. So much has been said about the much publicised “free and compulsory education” of the Akpabio’s administration, but very little objective attention has been paid to the quality of this education and the welfare of teachers, particularly primary school teachers. For me, the welfare of teachers in the state represents the true face of the free and compulsory education policy of Governor Akpabio. There are myriads of inadequacies in that policy ranging from poor infrastructure to lack of proper supervision. But those are issues for another day. It is unthinkable that a man who recently sponsored a Bill and compelled the State House of Assembly to pass same into law which entitles him to 200 million naira annual pay in pension with other ostentatious benefits after office will be owing primary school teachers their stipends. What a sad commentary, such a wicked world! I am not oblivious of the likely reaction of the governor, his yes men and praise singers to this article, but I am more mindful of the verdict of history. These teachers have suffered enough, their tears is my zeal. We cannot be talking about uncommon transformation when those who strive to lay a foundation for the next generation are crying to bed with empty stomach. A labourer deserves his wages. If not for anything, governor Akpabio should act now in memory and honour of his late mother who was also a primary school teacher. It will be disastrous to allow the next administration inherit the problems besetting primary school teachers in the state. And the time to act is now.